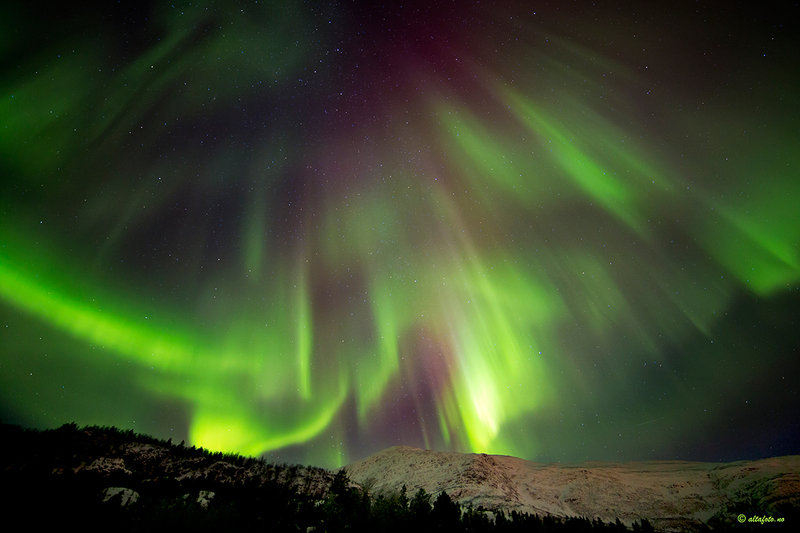 The aurora borealis – the northern lights – is a very popular topic in the area. After all, Alta is “The City of the Northern Lights”, so it’s no surprise that people would be coming here for a chance to see it in the winter. We get lots of questions every year from people hoping to maximize their chances of seeing the fascinating natural phenomenon. We are done with nighttime now – the sky last night at midnight was still a glowing twilight – and seeing the aurora is a thing of memory until next September. It might seem a little late to be writing about the northern lights, but the planning for next year’s holiday never stops and we’re already fielding inquiries for next year. So here is a little story, written out in FAQ form, compiled from conversations that I have now and then with travelers. Hope you get a chuckle. Q: Hi there! We want to come to Alta because we really want to see the northern lights! Q: Right! So, what time of year is best? Well… the problem is that the aurora strength has nothing to do with time of year, and the weather is totally unpredictable. So really, your chances are equal as long as it’s dark enough. Anytime between the end of September and the beginning of April is just fine. Q: But this will be a very expensive trip, so we really need to maximize our chances. Just give me an idea of what time of year is best? I… but there is no “best”… ok, I know. Think about the different times here in the arctic. Do you want snow or is that not important? Do you want to see the dark time, when there’s only a few hours of twilight each day, or would you rather have more daylight to explore the area? Q: What we really want is to see the northern lights. I read on a web site that the conditions are best in March. (March is either great, or not) Sure! March it is, then, and we’ll hope for the best. Q: Good, that’s what we thought, too. You should learn more about the probabilities for the northern lights. I will send you some web site links. That would be helpful, thanks, because living here year after year is no substitute for the wisdom of the Internet. Will you be scheduling other activities for your holiday? Q: Yes, we will schedule several daytime activities so that we have our evenings free to see the northern lights. Because even though Alta is beautiful with lots of fun things to do, our holiday will be ruined if we don’t see this unpredictable and elusive phenomenon. Ah, ok. So you’ll be going out on hunts every night? Q: No, we don’t want to take all those tours. Too much standing around doing nothing. We will be waiting in our hotel or maybe just taking a taxi out to drive around or something. Q: We are thinking that maybe we should change our tour to tomorrow night instead of tonight. Well… you CAN do that, of course, but the weather is really good today, and it is supposed to be a clear night tonight. If it were me, I would totally go. Q: Yes, but the KP Index is only a 2 today. Not to be disrespectful, but that whole KP Index thing is just another questionable prediction tool. Sometimes it works, sometimes not. Q: Yes, but I have this app on my phone (shows me the phone.) See, it says “2” here, and that means there will not be a very good show. It does say “Try”, though, so we are not sure. I’ve seen very nice displays no matter what that KP Index thing says. Also, KP One Million will not help you if you are not out at the time when the aurora appears. Q: I see. Can you call the tour provider and see if we can switch to tomorrow? (after the call) Actually, he is full tomorrow and anyway he says the conditions are perfect for tonight, probably better than it will be tomorrow. Q: Ah, too bad. Well, I suppose we will just have to go and hope for the best, then. Q: Just to let you know, we did go out last night and we did see the aurora. Yes! I was thinking about you – I was looking out my window at home last night around 9 PM and the whole sky was covered. I was hoping you got to see that! Q: Yes, but it wasn’t all that great. We didn’t see any red or pink light, even in the camera shots. Oh… well, up here, bright red and pink are pretty unusual colors. It’d be one in a thousand to just walk outside on some random night and get pictures of that. But at least you got a really strong display. Q: I suppose, even though it was all just sort of green. I think we’re going to book another tour on Thursday. The KP Index on our app shows a 4 for that day, and we will probably get some of those reds and pinks on that night. You can book it, of course, but there’s a pretty big storm moving our way and Thursday isn’t looking so good for weather. You might want to wait a day and see what Thursday’s weather is shaping up to be. Q: The app says “go”, so I think we’ll just book the tour.